After posting the Don’t Worry Be Happy video last week, in which Christopher Reeves did some whacky dancing, I dug up my old copy of his book and skimmed through it. Great read if you haven’t picked it up before. 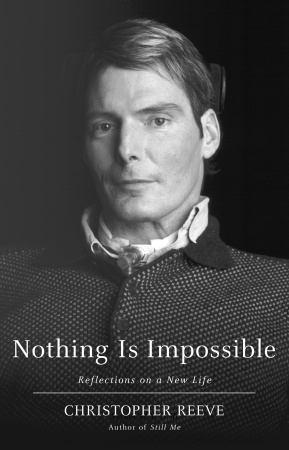 Nothing is Impossible is the story of his equestrian accident in 1995 which left him paralysed, his life afterwards, his attempts to heal his body and his work to promote spinal chord research. Although he ultimately died before his body could heal, through his hard work and determination in rehab, he was able to regain some movement in his fingers many years after the injury – something his doctors told him would never happen. He refused to accept his injuries as permanent or limiting and his attitude is incredibly positive and uplifting. The book covers topics such as parenting, faith and hope. He was and is an inspiration. Posted on: May 27, 2010 Comments: 0 Comments - Leave a comment!